We at Eggs to Apples are very proud to announce the launch of our new loyalty card programme. Its very simple. Fill in a simple application form and collect your card in store and start collecting. You’ll receive 1p per £1 spent in the shop and you can redeem on future shops or collect and use against your shopping. It’s our way of saying thank you for your custom. Eggs to Apples Trading Limited is a company incorporated under the Companies Act 2006 of England and Wales, with registered number 08974832 and whose registered address is at Eggs to Apples, 89 King Street, Maidstone, Kent ME14 1BG. References to “we”, “Eggs to Apples Trading Ltd” or “us” shall mean Eggs to Apples Trading Ltd, and references to “you” shall mean you, the member of the Programme. We have referred to these terms and conditions as the “Terms” throughout this document. A person can register with the Programme by applying for a collector card (“Loyalty Card”) and can then earn Points on various purchases. We will set up an account (“Account”) to record Points earned or redeemed by each holder of a Loyalty Card. By signing overleaf and by using the Loyalty Card, you agree to be bound by and comply with the Terms. The Programme is open to any person aged 18 or over and who has a resident UK, Channel Island or Isle of Man address. We reserve the right to refuse or to withdraw membership at any time. Each member is entitled to one Loyalty Card and Account only. We reserve the right to refuse, merge or close additional Accounts at any time. Members who live at and have Accounts registered at the same address may not join their Accounts together. Members must keep us informed of any changes to their personal or membership details. We will not be held responsible for any loss of points or benefits resulting from details being out of date or inaccurate. You must present your Loyalty Card at the point of purchase to qualify for Points under the Programme. Under the Programme we will award you Points earned on qualifying purchases made at Eggs to Apples Farm Shop and associated businesses. Qualifying purchases are any purchases that are not excluded in these Terms. Eggs to Apples Trading Ltd reserves the right to amend the exclusions on the above list from time to time. We will award 1 point for every £1 spent on qualifying purchases. We reserve the right to either increase or decrease the number of Points accrued on qualifying purchases from time to time, and we will notify you of any changes we make by updating the Terms on our Website. If we refund you for purchases that attracted Points, we reserve the right to deduct these Points from your Points balance at any time. You will not accrue Points on purchases that are paid for by redeeming Points. If you part-pay for a purchase by redeeming Points, you will only accrue Points on the balance of the purchase above this value. Your Points balance will be detailed on your most current Eggs to Apples Trading Ltd customer receipt. Legal title to all Points belongs to Eggs to Apples Trading Ltd and Points can only be redeemed at Eggs to Apples Farm Shop. Points can only be redeemed by the cardholder. Redeemed or cancelled Points cannot be used again. Points can only be earned, held, transferred or redeemed as set out in these Terms. Any other use, award, sale, exchange or transfer of Points, or attempt to do so, is a serious breach of these Terms. Any Points not earned and held in accordance with these Terms will be invalid and cannot be redeemed for any qualifying purchases. Points from more than one Account cannot be combined to redeem for the same goods or purchase. The Loyalty Card remains the property of Eggs to Apples Trading Ltd.
Eggs to Apples Trading Ltd reserves the right to refuse any Loyalty Card application, and is under no obligation to give reasons for the refusal. The Loyalty Card cannot be used in conjunction with any other offer unless specifically stated. The Loyalty Card must be scanned at the point of purchase to earn the points, and Points will not be awarded retrospectively where the Cardholder fails to present the Card for any transaction. You are solely responsible for any personal tax liability that may arise and for any other fees charged by governmental or non-governmental agencies as a result of your participation in the Programme. 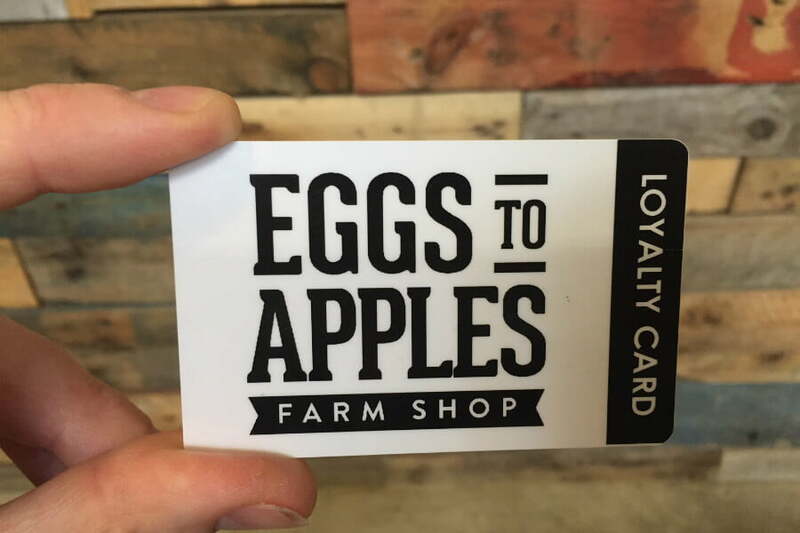 Eggs to Apples Trading Ltd owns all Loyalty Cards and must be returned to us on request or destroyed when no longer valid for use. We may close any Account on which no Points have been earned or redeemed for a continuous period of at least 12 months. We may also, on notifying a member, immediately suspend or terminate the rights of any member, and/or close any relevant Account, if they breach these Terms, if we reasonably believe that they have dealt with Points in a manner not permitted by these Terms, if there is any theft from or misconduct in connection with us, if they supply false or misleading information to us or if they are abusive or offensive to any member of our staff. A member can close his/her Account at any time by notifying us. If an Account is closed, the member’s rights to redeem Points from that Account are lost. It is your responsibility to notify us of any loss or theft of a Loyalty Card by contacting us on 01580 860566 or by emailing [email protected]. Your Loyalty Card balance is only protected from the point in time you notify us that your card is missing. We will freeze the remaining balance on your Loyalty Card at the time you notify us and will load that remaining balance on a replacement Loyalty Card. If your Loyalty Card is cancelled for any reason your Points will also be cancelled and no other financial or other benefit will be issued in respect of them. You cannot transfer Points to another person, including any other Programme member. Eggs to Apples Trading Ltd Ltd is the data controller for the purpose of the Data Protection Act 1998. By signing the application form and using the Loyalty Card you consent that we may process personal data that we collect from you in accordance with these Terms and the Data Protection Act 1998. Eggs to Apples Trading Ltd may use information that you supply to us on enrolment to the Programme (such as your name and address), together with any information relating to your transactions and purchases made from Eggs to Apples Farm Shop and participation in the Programme for the purposes of: administering the Programme; statistical analysis; sending you news of our special events, offers, promotions and magazines either by post, email, SMS or through any social network; and market research. You can, at any time after you have consented to receive information set out in the clause above, opt-out of receiving any and all such information by contacting Eggs to Apples Trading Ltd on 01580 860566 or emailing [email protected]. All communication that you receive from Eggs to Apples Trading Ltd will have details of how to opt-out or unsubscribe from receiving such information in the future. Eggs to Apples Trading Ltd will only share your details with companies within Eggs to Apples Trading Ltd, and businesses that assist with the operation of the Programme, such as external IT suppliers. Eggs to Apples Trading Ltd will not share your details with any other third parties without your explicit prior written consent. Your personal data will be held in the UK. We reserve the right to amend or terminate the Programme at our sole discretion. We reserve the right to vary or amend these Terms from time to time, at our sole discretion. We shall notify you of any changes to the Programme and/or the Terms on our Website. Earning or redeeming Points on an Account will constitute acceptance of the revised terms. These Terms prevail in the event of any conflict or inconsistency with any other communications, including advertising or promotional materials which we have issued or may issue, from time to time. These Terms shall be governed by English law and the courts of England and Wales shall have exclusive jurisdiction to settle any dispute or claim that arises out of or in connection with these Terms.